SupportEd has developed some free tools to help educators and administrators better serve English learners. 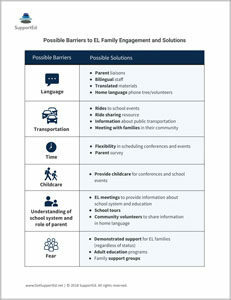 This tool offers six possible barriers to EL family engagement and solutions. We invite you and your colleagues to use this tool to facilitate conversation around shaping a welcoming environment for EL students and their families. This checklist offers classroom and school look-fors in four areas that align to Staehr Fenner & Snyder’s (2017) four guidelines for culturally responsive instruction. 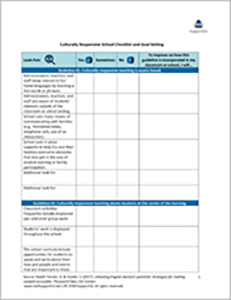 We invite you and your colleagues to use this checklist as a collaborative tool to facilitate conversation around culturally responsive instruction in your school and set goals for improvement. This bundle of three resources offers original, practical tools to help support you as you work towards the equitable grading of ELs. All teachers who work with ELs need strategies and tools to support ELs in accessing challenging content and acquiring academic language. 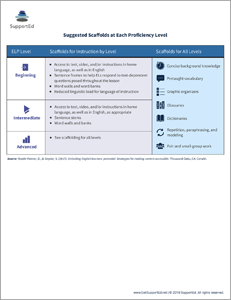 Our “Suggested Scaffolds at Each Proficiency Level” tool makes it easy to select appropriate scaffolding based on English language proficiency levels (ELP) so you can establish a framework for mapping your scaffolds to students’ ELP level. Once you have a foundation of EL scaffolds, it’s important to consider different scaffolding categories to maximize the ways in which your ELs can benefit. 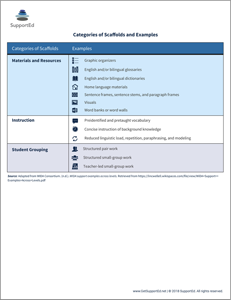 Use our “Categories of Scaffolds and Examples” graphic to break down the three main categories of EL scaffolds and incorporate some of our examples into your instruction. Helping your ELs thrive academically and personally requires more than knowing and selecting appropriate scaffolds. It’s important to think deeply about the best ways to incorporate those scaffolds into your instruction so you and your colleagues can set goals for encouraging EL success. 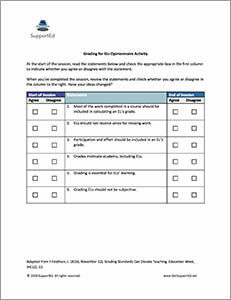 Our “Scaffolded Lesson Planning Checklist” provides considerations and guidelines in doing so. Many school districts are using Diane Staehr Fenner’s book Advocating for English Learners: A Guide for Educators as a foundation for their book study or Professional Learning Community (PLC). 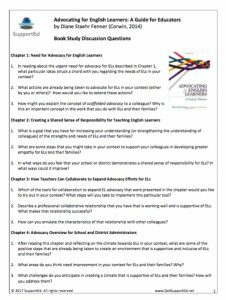 To help guide educators’ discussions around the topics in this book, we’ve designed discussion questions framed around the book’s chapters. 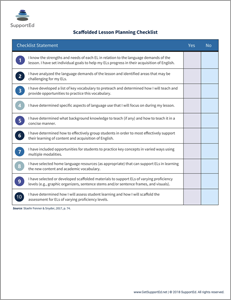 We encourage you to download this useful list of questions and launch your own groups to focus on advocating for English Learners. 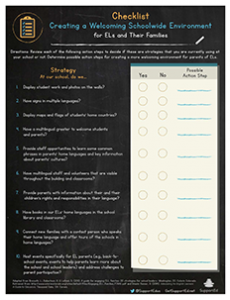 This checklist is a tool that you can use to evaluate the steps your school is taking to make ELs and their families feel welcome. Once you have assessed what you are currently doing, you can set goals for creating a more welcoming environment at your school.